Download "INSTALLATION RECOMMENDATIONS. 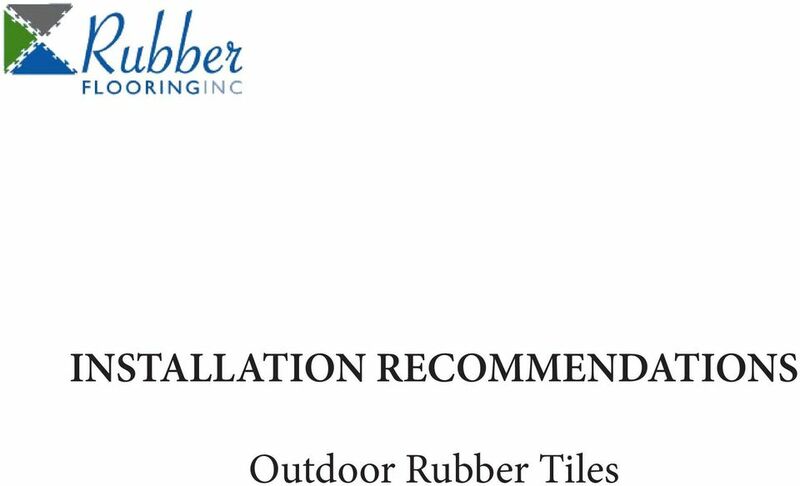 Outdoor Rubber Tiles"
2 Prior to Installation: The Outdoor Rubber Tiles and accessory transition pieces intended for this installation have been shipped to you via a freight carrier on pallets with the tiles shrink wrapped and strapped. Once the packing is removed, please inspect the tiles for any damage that may have occurred during shipping. 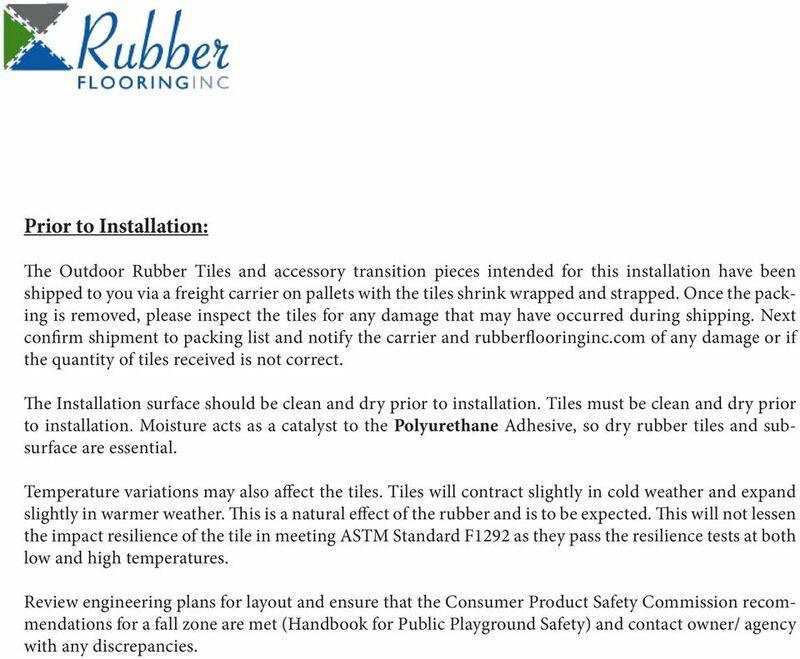 Next confirm shipment to packing list and notify the carrier and rubberflooringinc.com of any damage or if the quantity of tiles received is not correct. The Installation surface should be clean and dry prior to installation. Tiles must be clean and dry prior to installation. Moisture acts as a catalyst to the Polyurethane Adhesive, so dry rubber tiles and subsurface are essential. Temperature variations may also affect the tiles. Tiles will contract slightly in cold weather and expand slightly in warmer weather. This is a natural effect of the rubber and is to be expected. This will not lessen the impact resilience of the tile in meeting ASTM Standard F1292 as they pass the resilience tests at both low and high temperatures. Review engineering plans for layout and ensure that the Consumer Product Safety Commission recommendations for a fall zone are met (Handbook for Public Playground Safety) and contact owner/ agency with any discrepancies. 4 SECTION 1 - Tools and Equipment Necessary for Installation. Rubber Gloves. Safety Gloves. Razor Knife with Extra Blades. Chalk Line. Carpenters Square. Paint Roller Frames, Roller Extensions and Fluffy Rollers or 1/16 or 1/8 V-Notch or Square Notch Trowel. Paint Roller Trays. Water Spray Bottles (Mist). Rubber Hammer. Measuring Tape. ½ Electric Drill. Hole saws ( to cut diameter of equipment supports). 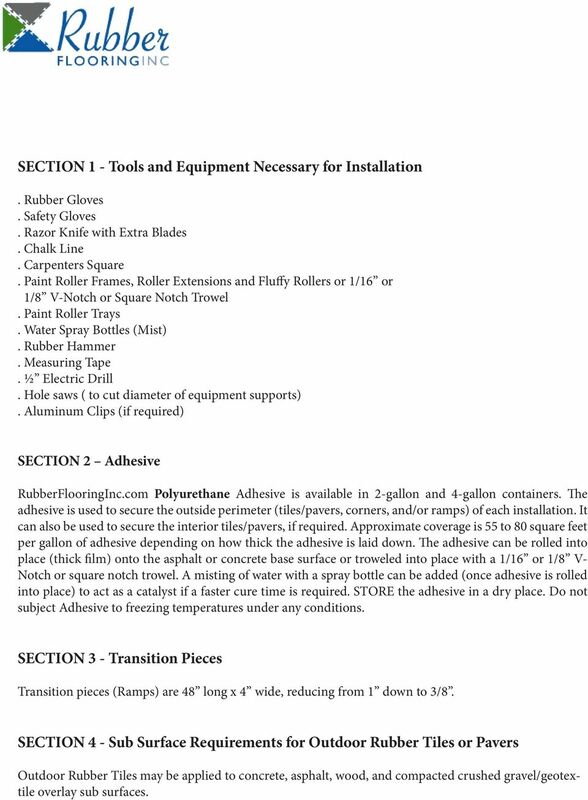 Aluminum Clips (if required) SECTION 2 Adhesive RubberFlooringInc.com Polyurethane Adhesive is available in 2-gallon and 4-gallon containers. The adhesive is used to secure the outside perimeter (tiles/pavers, corners, and/or ramps) of each installation. It can also be used to secure the interior tiles/pavers, if required. Approximate coverage is 55 to 80 square feet per gallon of adhesive depending on how thick the adhesive is laid down. The adhesive can be rolled into place (thick film) onto the asphalt or concrete base surface or troweled into place with a 1/16 or 1/8 V- Notch or square notch trowel. A misting of water with a spray bottle can be added (once adhesive is rolled into place) to act as a catalyst if a faster cure time is required. STORE the adhesive in a dry place. Do not subject Adhesive to freezing temperatures under any conditions. SECTION 3 - Transition Pieces Transition pieces (Ramps) are 48 long x 4 wide, reducing from 1 down to 3/8. 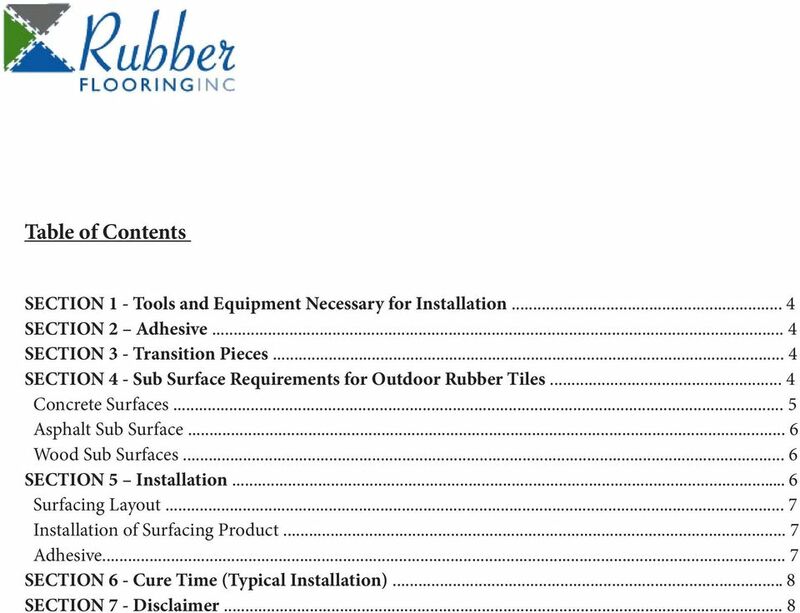 SECTION 4 - Sub Surface Requirements for Outdoor Rubber Tiles or Pavers Outdoor Rubber Tiles may be applied to concrete, asphalt, wood, and compacted crushed gravel/geotextile overlay sub surfaces. 5 All sub surfaces should be properly excavated and installed to insure: 1. Sub surface drainage. 2. Non-Separation of concrete layers. 3. Prevention of Heaving due to freeze/thaw or unstable ground conditions. The stabilization of the sub surface is the sole responsibility of the installer and/or owner. Sub surface installation should assure good drainage of the area by either a well-defined gradient of the surface or well-placed drainage pipe in lower spots of the installation. The Outdoor Rubber Tiles or Pavers shall be adhered to the concrete, asphalt, geotextile or wood surface using Polyurethane adhesive and/or Dowel Pins system following the installation instructions for adhered installations. 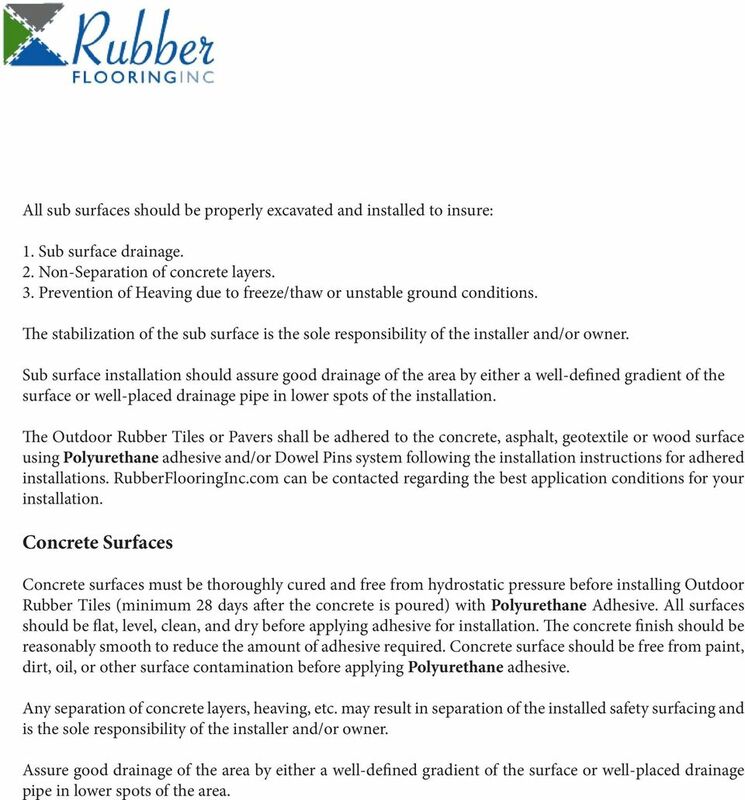 RubberFlooringInc.com can be contacted regarding the best application conditions for your installation. Concrete Surfaces Concrete surfaces must be thoroughly cured and free from hydrostatic pressure before installing Outdoor Rubber Tiles (minimum 28 days after the concrete is poured) with Polyurethane Adhesive. All surfaces should be flat, level, clean, and dry before applying adhesive for installation. The concrete finish should be reasonably smooth to reduce the amount of adhesive required. Concrete surface should be free from paint, dirt, oil, or other surface contamination before applying Polyurethane adhesive. Any separation of concrete layers, heaving, etc. may result in separation of the installed safety surfacing and is the sole responsibility of the installer and/or owner. Assure good drainage of the area by either a well-defined gradient of the surface or well-placed drainage pipe in lower spots of the area. 6 Asphalt Sub Surface Asphalt sub surface must be hard, level, and free of grease, oil, and other contaminants. Avoid installation on new asphalt until surface oil has had time to dissipate (minimum 30 days after compacting) and drainage can be evaluated. Any separation of asphalt or blacktop layers, heaving etc. may result in separation of the installed safety surfacing and is the sole responsibility of the installer and/or owner. Insure good drainage of the area by either a well-defined gradient of the surface or well-placed drainage pipe in lower spots of the area. Wood Sub Surfaces The wooden sub surface should be properly secured to ground to avoid any ground shifting (as by pile or other means) and subsequent sub floor movement. The sub floor should be protected and sealed from moisture prior to installation of Outdoor Rubber Tiles or paver tiles. The sealer should be completely dry before installation. The sealer should be compatible with Polyurethane adhesive before tiles are applied (avoid use of surface treatments that leave oil residues on surface). The wood surface should be free from any protruding nails and screws. All damaged wood should be replaced on old surfaces. The surface should be level, clean and dry before application. SECTION 5 Installation ADHERED SYSTEMS Installation Checklist: 1. Insure that the base surface is clean, level, and dry. Tiles and Pavers must also be dry. 2. Check ambient air temperature. Minimum recommended temperature for installation is 50 degrees and rising. 3. Please note: All outdoor playground equipment must be permanently installed prior to installation of outdoor rubber tiles. 7 Surfacing Layout Lay paver tiles (transition pieces if required) from the further corner along base edge in two directions. (90 Degrees) Lay out the rest of the installation, leaving out any tiles or pavers that must be cut to fit. Keep edges straight and aligned horizontally and vertically for square tiles. Installation of Surfacing Product Once installation layout has been completed; adhere all perimeter pieces to help keep the tiles in place. If drainage is a concern, allow a ¼ gap between each Ramp piece for drainage. Install the balance of the floor tiles in the remaining field. 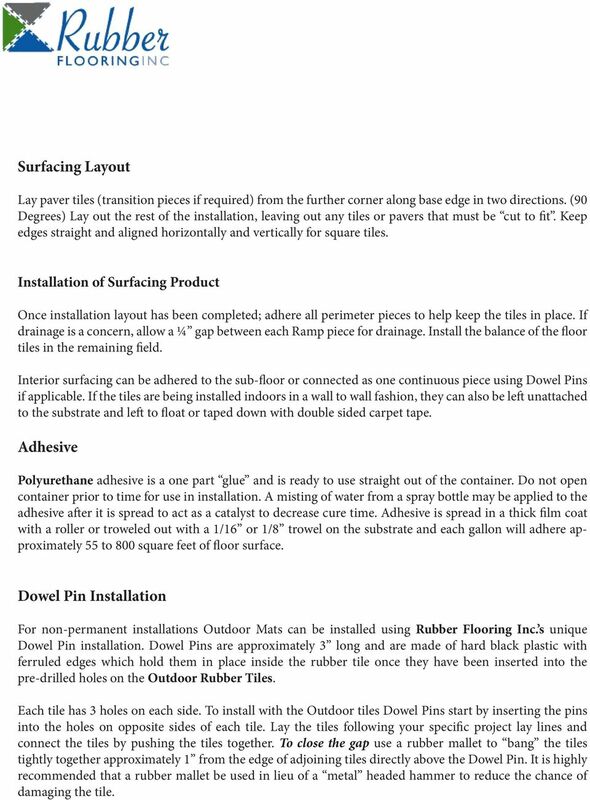 Interior surfacing can be adhered to the sub-floor or connected as one continuous piece using Dowel Pins if applicable. If the tiles are being installed indoors in a wall to wall fashion, they can also be left unattached to the substrate and left to float or taped down with double sided carpet tape. Adhesive Polyurethane adhesive is a one part glue and is ready to use straight out of the container. Do not open container prior to time for use in installation. A misting of water from a spray bottle may be applied to the adhesive after it is spread to act as a catalyst to decrease cure time. Adhesive is spread in a thick film coat with a roller or troweled out with a 1/16 or 1/8 trowel on the substrate and each gallon will adhere approximately 55 to 800 square feet of floor surface. Dowel Pin Installation For non-permanent installations Outdoor Mats can be installed using Rubber Flooring Inc. s unique Dowel Pin installation. Dowel Pins are approximately 3 long and are made of hard black plastic with ferruled edges which hold them in place inside the rubber tile once they have been inserted into the pre-drilled holes on the Outdoor Rubber Tiles. Each tile has 3 holes on each side. To install with the Outdoor tiles Dowel Pins start by inserting the pins into the holes on opposite sides of each tile. Lay the tiles following your specific project lay lines and connect the tiles by pushing the tiles together. To close the gap use a rubber mallet to bang the tiles tightly together approximately 1 from the edge of adjoining tiles directly above the Dowel Pin. It is highly recommended that a rubber mallet be used in lieu of a metal headed hammer to reduce the chance of damaging the tile. 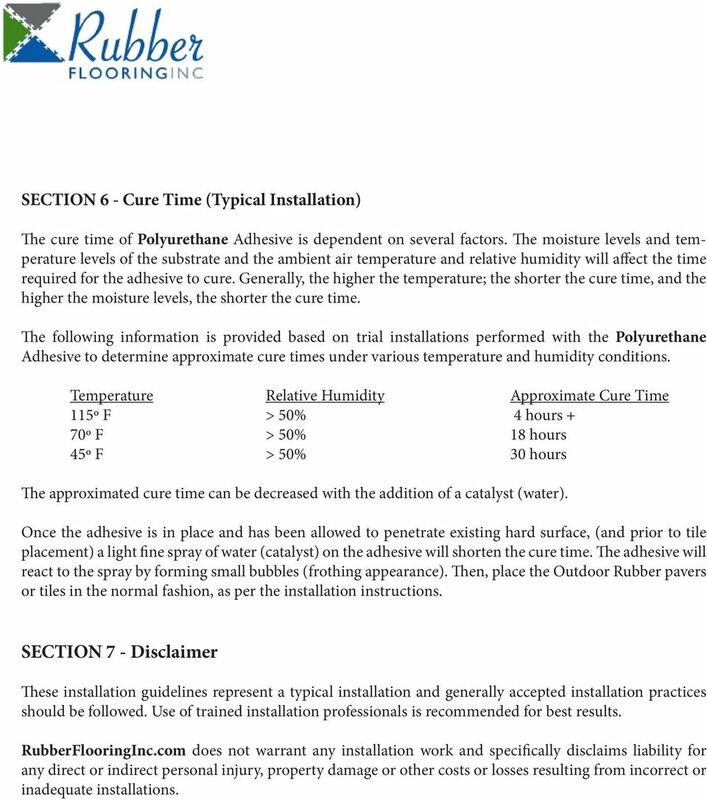 8 SECTION 6 - Cure Time (Typical Installation) The cure time of Polyurethane Adhesive is dependent on several factors. The moisture levels and temperature levels of the substrate and the ambient air temperature and relative humidity will affect the time required for the adhesive to cure. Generally, the higher the temperature; the shorter the cure time, and the higher the moisture levels, the shorter the cure time. The following information is provided based on trial installations performed with the Polyurethane Adhesive to determine approximate cure times under various temperature and humidity conditions. Temperature Relative Humidity Approximate Cure Time 115º F > 50% 4 hours + 70º F > 50% 18 hours 45º F > 50% 30 hours The approximated cure time can be decreased with the addition of a catalyst (water). Once the adhesive is in place and has been allowed to penetrate existing hard surface, (and prior to tile placement) a light fine spray of water (catalyst) on the adhesive will shorten the cure time. The adhesive will react to the spray by forming small bubbles (frothing appearance). Then, place the Outdoor Rubber pavers or tiles in the normal fashion, as per the installation instructions. 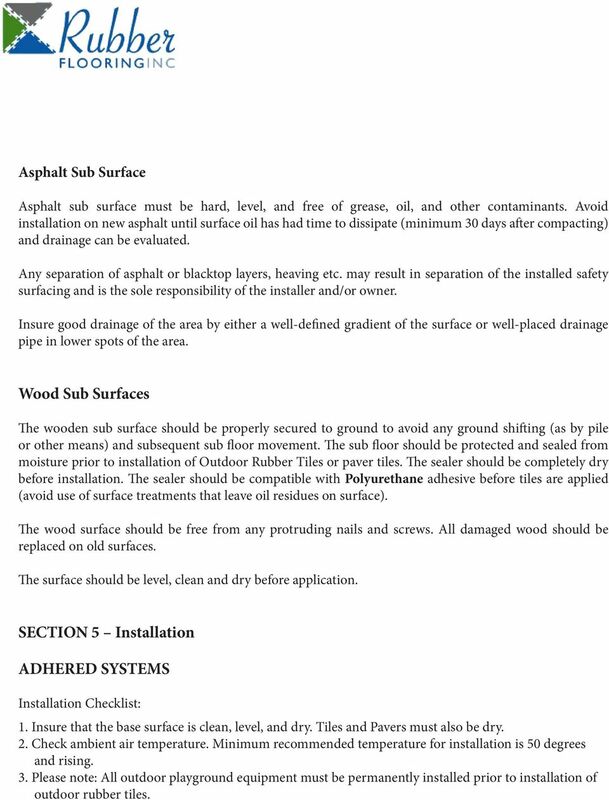 SECTION 7 - Disclaimer These installation guidelines represent a typical installation and generally accepted installation practices should be followed. Use of trained installation professionals is recommended for best results. RubberFlooringInc.com does not warrant any installation work and specifically disclaims liability for any direct or indirect personal injury, property damage or other costs or losses resulting from incorrect or inadequate installations. DIY. made. easy! Don t just DO IT YOURSELF DO IT WITH BEAUMONTS! space between boards. Fasten with 1-1/2" galvanized roof nails every 6". WPC OUTDOOR DECK INSTALLATION GUIDE INFORMATION ABOUT PRODUCT WPC (Wood Plastic Composite) is a new type of material made by mixed wood powder with HDPE (High Density Polyethylene) and other chemical additives. Site Preparation: 2. Remove the sod and soil to the desired depth. Remember to account for the width of the forming lumber. Solar Pool Heating System Installation Manual Read the complete manual before beginning the installation 1. Sizing the System Visit www.techno-solis.com to size the system using the sizing calculator. Colors should be variations of tans or grays. Champagne is too light and other special colors should be approved on an individual basis. DOUBLE-GLUE INSTALLATION GUIDELINES for FOUNDATION Contract Carpet Cushion By Healthier Choice SUMMARY The double-glue installation method is a standard approach to cushioned carpet in the commercial setting. Please calculate with around 5% more square meters than needed because you will have material loss due to cutting and sorting.